Our Curbside Drop service is $100 for any safe and it applies to our Southern California customers only. Longer distances will increase the cost accordingly. This is done by our own professional West Coast Safes delivery and installation crews in unmarked trucks. This service does not include unpacking, setting up, or installing your safe. Our In Home/Garage/Business Ground Floor Installation service applies to our Southern California customers only. It starts at $200 and increases based on the size and weight of your safe. This is done by our own professional West Coast Safes delivery and installation crews in unmarked trucks. Our service includes bringing the safe inside while protecting your flooring and thresholds as needed, unpacking it, getting the safe into its final position, shimming it level, anchoring it to the floor (if possible/wanted), setting up the interior, and teaching you how to use it. For installations involving more than 4 steps, our Upstairs Installation rates will apply. West Coast Safes have gun safe movers that can handle your safe move from A-Z. Upstairs installations are usually limited to safes under 1,000 lbs and cost an additional $100 minimum. Anchoring a safe upstairs usually involves screwing it to the wooden sub-floor and this is considerably less secure than bolting down to concrete. Since each staircase is different, we recommend calling the showroom and speaking with a member of our sales team to determine if taking a safe up your staircase is a possibility. Please be prepared with the measurements of any landings involved as that is the primary limiting factor. We ship safes all over the country and our standard LTL Freight service will deliver to your business or residence. We can also ship with lift-gate service if you do not have a forklift or dock on site. This service is curbside only and does not include unpacking, setting up, or installing your safe. We typically recommend UPS Freight for this as they have nationwide hubs and excellent liability coverage. Lift-gate service is only available on safes up to 2,500 lbs. For safes over 2,500 lbs, a forklift or dock will be required at the destination. If you need to get your safe professionally installed and you are not in Southern California, we have a large network of installers nationwide who can typically accommodate your needs. LTL Freight to one of their business addresses is typically cheaper than lift-gate service to your residence. We also offer a complete safe moving service, whether you are moving in Southern California or across the country. To learn more, check out our Safe Moving page. 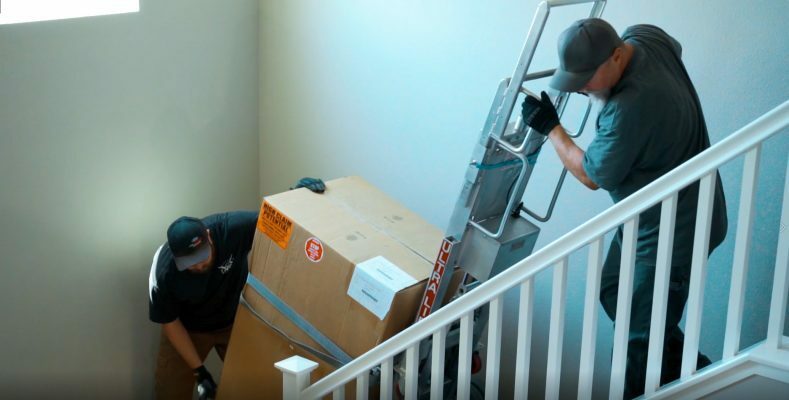 To prepare for your safe’s delivery and installation, check out our video below to see what you can expect from the West Coast Safes installation crews. West Coast Safes has been selling, delivering and installing safes and gun safes in Southern California since 1990. Through the years we have installed tens of thousands of safes all over Southern California from our showroom and warehouse in the city of Ontario, California. We have our own unmarked trucks and highly trained delivery and installation professionals that deliver, install, level and bolt down safes in Los Angeles County, San Bernardino County, Riverside County, Orange County, San Diego County and also Ventura, Santa Barbara and Imperial Counties. In Southern California you can never live too far for us to not be able to service your safe and gun safe needs. West Coast Safes sells more safes in a single month than most lock and safe dealers sell in a whole year and because of this high volume our prices for safes and delivery/installation are usually hundreds less than the safe dealer right down the street. West Coast Safes also offers economical safe and gun safe moving. With West Coast Safes, you can always count on the Best Safes, Best Service and the Best Pricing since 1990. Click on the county to view many of the California cities that we offer delivery and installation to. Safe, gun safe and vault delivery and installation is done professionally by our own crews and trucks. Safe and gun safe moving done right.